I don't buy a lot of canned food, so that aisle has been a great place to look for new-to-me foods. I was curious about a can of Green Boiled Peanuts. When I saw they were labeled "The South's Favorite Snack!" ... well, I couldn't resist. Who wouldn't want to try the South's Favorite Snack?! I was optimistic. I love peanuts. Dry-roasted, honey-roasted, made into peanut butter, and even raw (we grew them when I was a kid)- all delicious. I had no reason to believe I wouldn't like Green Boiled Peanuts. Until I opened the can. Let me interrupt myself by saying that I have visited the South on many occasions and have many wonderful friends with a Southern heritage. For the most part, they have impeccable taste. Or so I thought. If these Green Boiled Peanuts are indeed their favorite snack, I have seriously misjudged them. When I opened the can, I was overwhelmed by the smell. If you've been to a camp or institution that served overcooked, fat green beans from industrial-sized cans, you know the smell. The taste was similar. The peanuts were mushy, musty, soggy and salty. They weren't inedible, but they were a far cry from what a peanut could (and should) be. The three of us (my sister-in-law Lisa and friend Kelly) tried the peanuts straight from the can, then heated, following the directions on the can. Lisa had a slight preference for the heated version, while Kelly and I had a slight preference for the room-temperature peanuts. While heat seemed like it would help, it just made the overcooked green bean smell more intense. I gave them a 4, but in retrospect, I think that was too generous. I'm smiling because I hadn't tasted one yet. Southern friends- what do you have to say for yourselves? 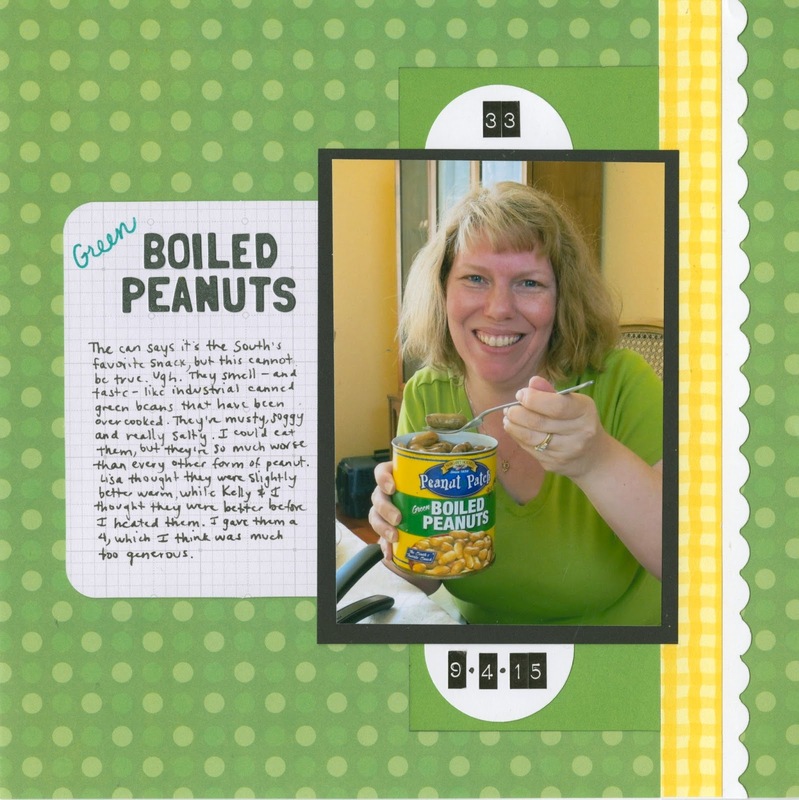 Are Green Boiled Peanuts indeed your favorite snack? YIKES!! The name alone would have had me running away!! LOL!! And I love PEANUTS!!! LOVING the page .... the colors are perfect!!!!! Most definitely NOT! Great page. I have never tried them. I googled them and there seem to be a lot of recipes with 4 stars for them. Perhaps it's just the canning that makes disagreeable. I have had them fresh, made them myself, but never from the can. The first time I tried them I was very put off by the texture, not expecting a mushy peanut. The next time some time later they were good. Freshly made they are soft yet firm. They are still in the shell and are boiled in a brine. To eat you put the peanut shell and all in your mouth, pop it open with your teeth, and then eat tje nut and discard the shell. I like them better straight from the hot brine and more to the spicy side. They don't sound appetizing at all...hehe. But your page is lovely. I love that you were wearing green in your photo. Being from the North, the first boiled peanuts that I tried were also wee from a can. Also did not like. Now that you cn buy them from the Flea Markets, road side vendors, or from gas stations, it is a different story. Love them. Although I can not handle the amount of salt used. But a green peanut is used. Which basically means a fresh peanut with nothing done to it. They are put into a crock pot with salt ro taste usually a cup or more. They use other flavorings such as ham(my favorite) hot sauce ect. They should be eaten warmed and fresh from a vendor. They do last in the refrigerator for a couple of days, but should be warmed each time you go to eat them. Once my parents came to Charleston SC they took a bag of peanuts back and made their own for other family members. I love your layout! Perfect use of the green to go with your theme and your shirt! I have never tried canned boiled peanuts. I cannot imagine that they would be good. Fresh, hot boiled peanuts from a street vendor? That's another story. Yum! !